Placemaking is a simple concept based on a single principle – people choose to live in places that offer the amenities, resources, social and professional networks, and opportunities to support thriving lifestyles. Michigan’s leaders have embraced placemaking. MiPlace is a a statewide initiative with the purpose of keeping Michigan at the forefront of a national movement known as placemaking. It’s a simple concept that people choose to live in places that offer the amenities, resources, social and professional networks, and opportunities to support thriving lifestyles. CEDAM is among the many partners that work to improve the quality of life of Michigan’s citizens by promoting the creation of vibrant cities, towns, and villages, and in so doing, make Michigan’s communities competitive in the new global economy. This guidebook is currently available for free for Michigan residents. This tool describes much of the placemaking curriculum and highlights case studies. Learn more about it in this informational webinar. 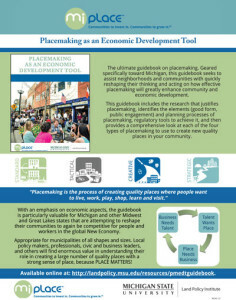 If you are a Michigan resident and interested in obtaining a free copy of the Placemaking Guidebook, please fill out this user agreement.